If you own a Focus Hatch, then you know your options are pretty limited if you're looking for a truly custom box that doesn't fill up your cargo space. Well not anymore. We've designed a really nice box that won't eat up your cargo room. Best of all, you don't need to take out a mortgage to pay for it. 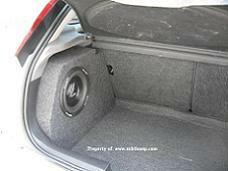 Our box tucks neatly in the driver's side pocket of the cargo area and comes empty so you can put your own woofer in it. It is made of 3/4" mdf, not molded plastic like some others. The box naturally locks into place upon installation, but we also include velcro strips for added security and the ability to move the box quickly if needed without tools. No screws or drilling holes is necessary. 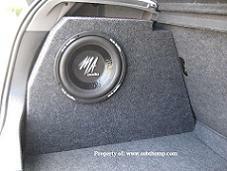 This is a sealed box that can fit one 10" o 12" sub or we can also cut it for the 10" kicker L5/L7 square subs. All in all, nobody gives you the choices that we offer in a package that is this attractive and affordable. So if you are in the market for bass in your Focus hatchback, then look no further. note: magnet diameters must be less that 7" dia. 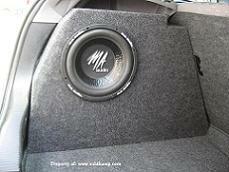 I installed this box in a Focus SVT...phenomenal! I went with one 10" because I had one sitting around. I took out two 12's and this thing hits almost as hard with one 10". It's solid, sturdy, very well built. I've recommended it to my friends already. The best part is I can now use my trunk!!! Great product..